6) PROUDLY MADE IN THE USA! The health and safety of military forces is mission critical and essential to survival. Heat stroke, exhaustion from heat, the inability to sleep and the ensuing stress are all factors that will wear down the soldier’s ability to perform an already demanding job. Add to this the output of heat from the many electronic devices now accompanying soldiers onto their bases, and the requirement for temperature control becomes paramount. Through the General Services Administration, we can fulfill portable air conditioning contracts for Military ECU systems to federal agencies to help better serve the public. This includes all military needs, as well as supplying our AC products and Environment Control Units to better serve federal employees. 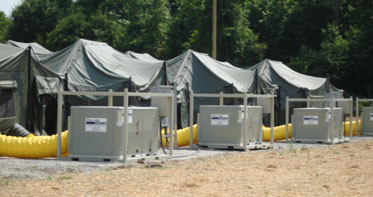 We understand that government agencies have a need to keep FEMA trailers cool in the heat of summer, cool secure high-tech government server rooms, etc. We make it a point to work alongside government agencies and contractors to get their ECU's up and running in no time. 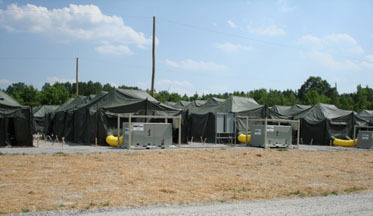 The ECU's are often located outside of temporary buildings and can accommodate large or small areas suitable for tents, temporary barracks, special events, etc. These units are capable of being carried, trailered and reinstalled between locations and even from room to room. Setting up and tearing down goes quickly and easily as the flexible ductwork needed for air supply and return can be channeled through a door or window in the facility. Depending upon the size of the structure, these moveable air conditioners can be skid or trailer mounted and are capable of cooling, heating and dehumidifying (depeding on the unit). For more information on our AC units and/or how we might be able to help keep you cool, please contact us. Perfect for cooling computer server rooms and much more. Available as rentals or for purchase. *These units are not intended for home use. Copyright © 2012, Cold Air Products. Cold Air Products is a division of Stokley's Services, Inc.